Happy Friday, everybody! This week, we make a trip back to the Kingdom of Colton, if only briefly. A while ago, I got involved on a discussion thread about creating a storytelling resource. Not just any storytelling resource, but a coach. Specifically, a coach with side panels that could be removed for setting up story pics of conversations inside the coach. My guess is that the project was never completed. Never heard much about it after it was originally proposed. Not long ago, I was chatting with my good friend LadyAquanine on The Sims 2 Discord (Come check us out! It's a fun little community. ), and the topic came up. We determined that while the original idea was really cool, it never saw the light of day. She asked me nicely if I would consider completing the project, and here we are. Dragon Slave for the original horse object. It takes some explaining. 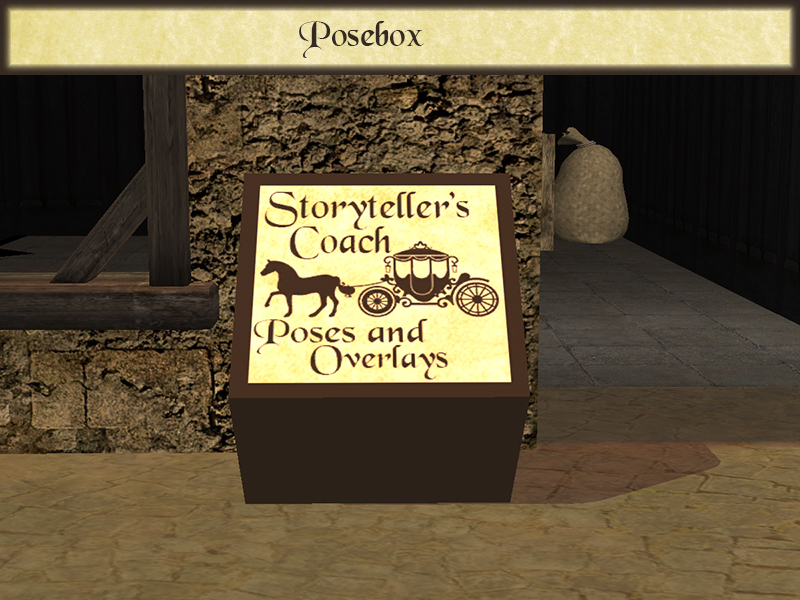 What you get is a six objects that can be assembled to form a coach, along with some poses and overlays to go with them, and of course a collection file. IMPORTANT: The coach is slaved to Hexameter's original object. 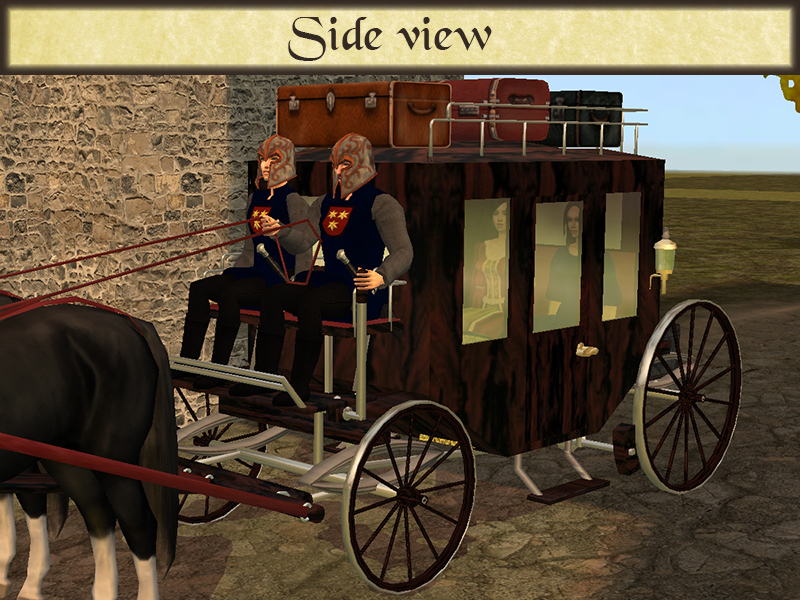 The horses are slaved to Dragon Horse's original object (I like it better than the original horse that comes with the coach because it has a lot more recolor options). 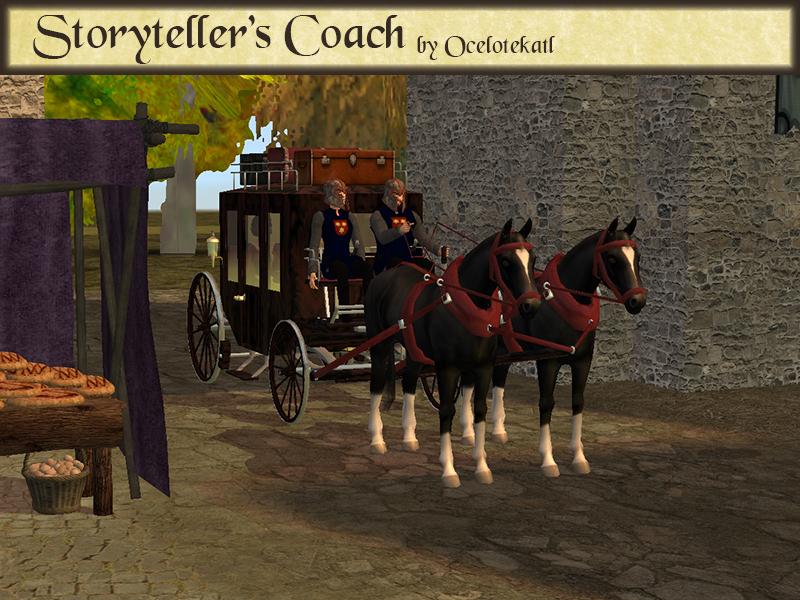 You'll need to have both of the master objects in your download folder for the Storyteller's coach set to appear correctly. 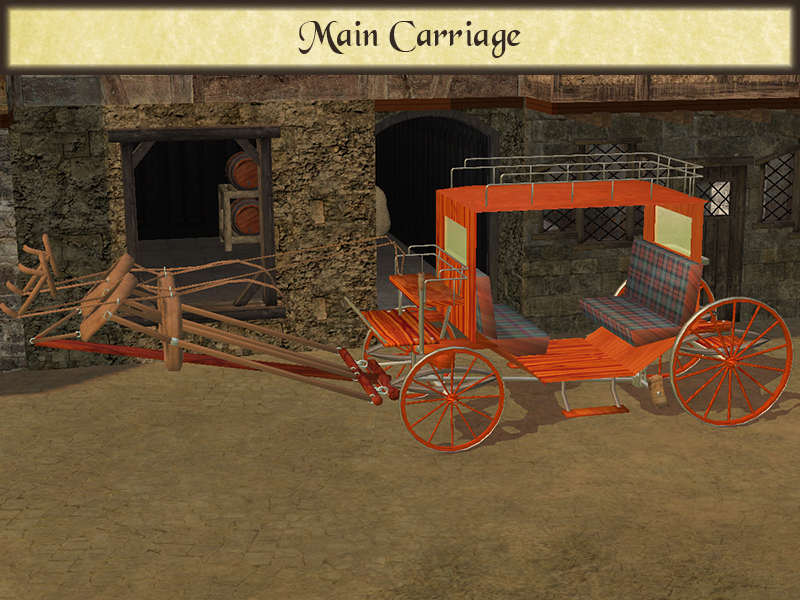 The main carriage object has seven deco slots and six posing slots. 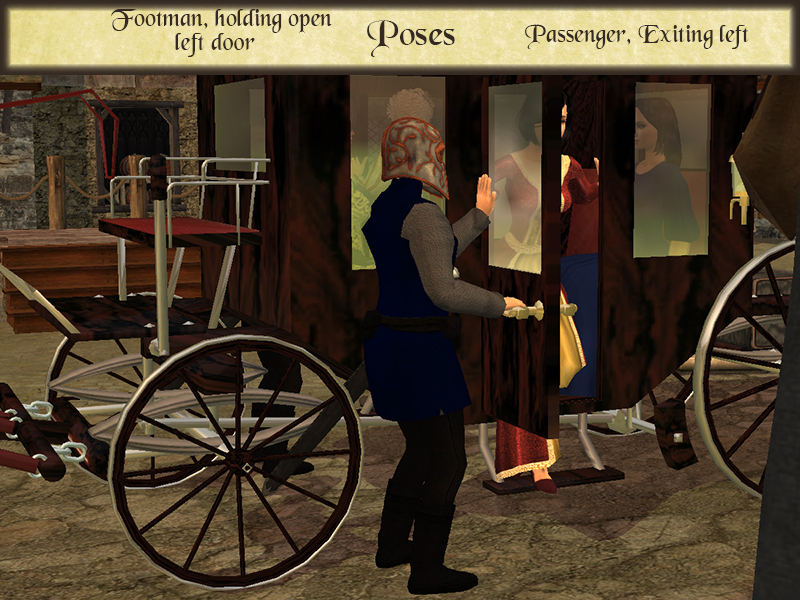 The location is kind of fiddly, but if you place the objects on the main carraige's lead tile, they'll snap into place. 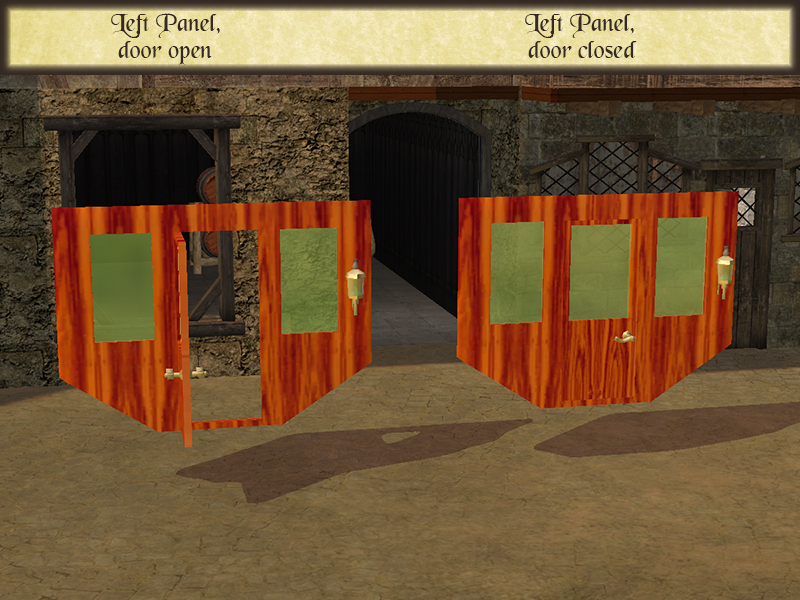 The first three are the "coach" slots, intended to hold the side panels and the horses. Once you've filled these slots, the next four are "roof" and "tailgate" slots, intended for placing your favorite deco deco trunks, suitcases, chests, or strongboxes. The last six slots hold the Sims in place for posing. 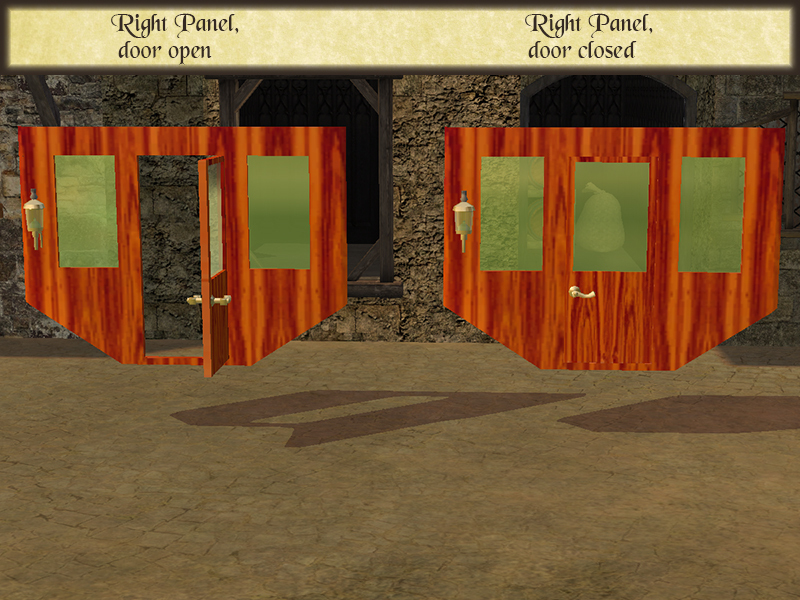 To use the object, stack all of the deco objects and sims into the slots, and play the poses. 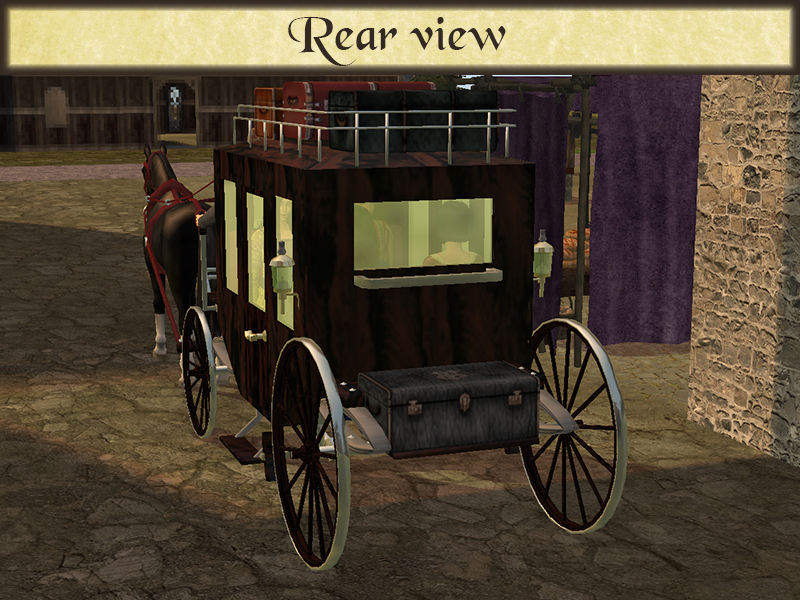 To reposition the entire coach after everything has been placed, "grab" the the main coach object. The driver and footman poses are fairly straightforward. The passenger overlays are applied to the lower torso only. They're intended to be used with Decorgal's Talk Hack Changed to Overlay by Akihiro (the sitting one). Don't use Argue chair.../ or Talk chair.../ menu options. You may need to add the Back Lower.../ overlay as well. 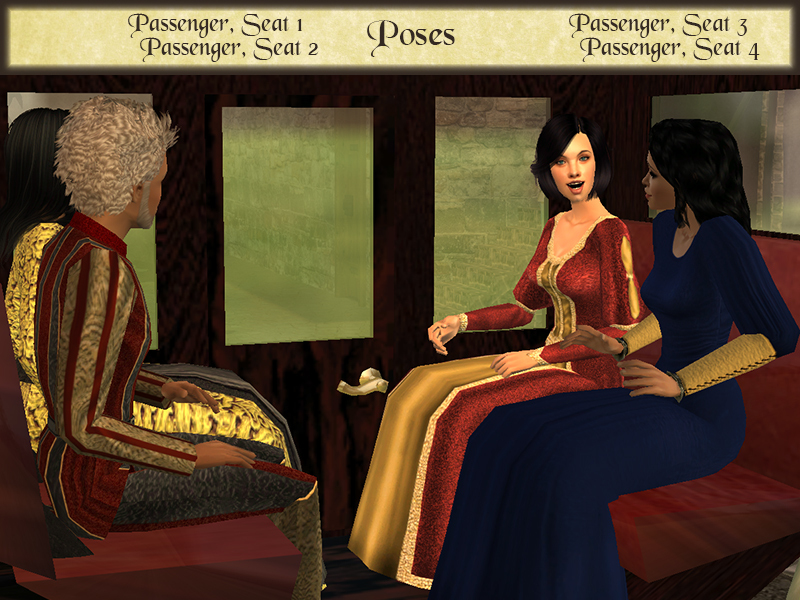 These poses are intended for taking photos of your Sims having a conversation inside the coach. 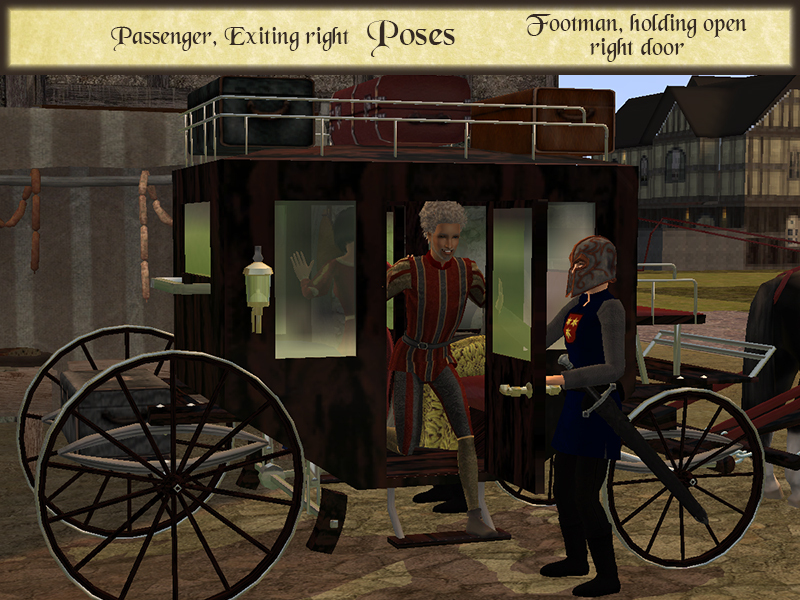 The dismounting poses are also fairly straightforward. Everything you get with this download. Thorough as always! Many thanks. Hi, there! It was a cool idea and I'm glad I could help flesh it out. Enjoy. It's a neat prop to have if your Sims are traveling somewhere in a coach.I'm glad you like it, and I appreciate the feedback. Wow! A brilliant idea, and superbly executed (but then again, I'd expect nothing less from you). :D And to make it even better, it's something I'll have use for a few chapters into my story (I thought I'd have to do without screenshots for that section, but now I won't have to, yay!)! Thank you, LadyAquanine, for suggesting it, and you, Oce, for realising it! Hi, Nix! This is a neat little tool for medieval stories. My hope is that storytellers now have a way to frame scenes for traveling from place to place (and arriving with style!). We really, really miss your stories. If/when you get to the point where you publish it, please send me a link. This is a wonderful must-have for my Sedona hood. Thank You! And thank you Lady A for requesting this useful item. One question though - is there any reason why I could Not use DS's horses with their trotting/galloping poses instead of the horses you provide? I'm pretty sure that you could, but the bridle might not line up just so. The horse object is really just side-by-side models of "Pose 1". I made it for convenience's sake, so that it can be stacked onto the coach and picked up and moved with the rest of it, but it's possible to put one of the other models on a separate OMSP and use boolprop snapObjectsToGrid false to reposition it. 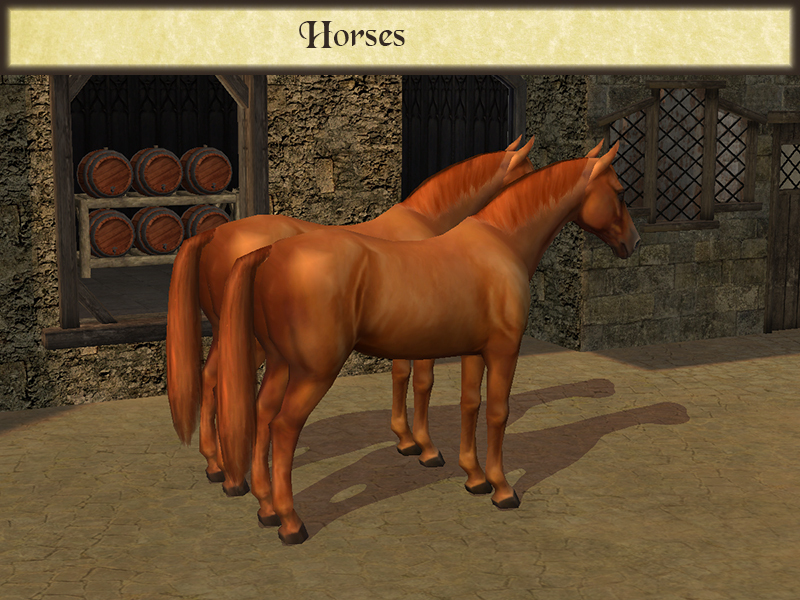 Maybe in the future I'll revisit the project and add some new options for the bridles and horses.